XPE Semi-micro Analytical Balances use StaticDetect™ and static elimination technology coupled with an improved SmartGrid weighing pan give you trustable, highly repeatable results. The innovative StatusLight™ balance ready indicator and easy routine testing with the TestManager™ boost your quality management and ease of compliance. XPE Analytical Balances use StaticDetect™ and static elimination technology coupled with an improved SmartGrid weighing pan give you trustable, highly repeatable results. The innovative StatusLight™ balance ready indicator and easy routine testing with the TestManager™ boost your quality management and ease of compliance. The StatusLight built into the terminal uses color to indicate intuitively the status of the balance: Green means ready, yellow is a warning, and errors are shown with red. The StatusLight clearly communicates if the balance is ready for you to start your weighing task. The StatusLight clearly communicates if the balance is ready for you to start your weighing task. Green is ready, yellow is linked to routine testing with Test Manager and Red means immediate corrective action, such as the balance is out-of-level. Using the balance touchscreen, your testing SOPs can be implemented in the TestManager™ embedded software. Whenever a test is due, a message will be displayed on the screen and you can simply follow the test instructions provided. MinWeigh protection always ensures you are weighing accurately for the upmost process security. Our unique StaticDetect technology detects electrostatically charged samples or containers. There is a warning if the weighing error exceeds a user-defined limit; antistatic measures can then be employed. For highest process security you can impose a block on release of the weighing result. StaticDetect - For the highest process security, our new sensor technology detects electrostatic charge on the sample and/or its container. The weighing error is measured and a warning is given if the user-defined limit is exceeded. AntiStatic-Kits - The new compact antistatic kit can be used to gently generate charged ions and hence eliminate electrostatic charge without causing turbulence in the weighing chamber. The steady stream of ions prevents cross-contamination of samples and removes the threat to users when handling toxic substances. Antistatic options are available both internally and externally. ErgoClips - The ErgoClip basket acts as a Faraday Cage to shield the balance from any electrostatic charge which could be present on glass and plastic tubes. Weighing samples in tubes is therefore more safe and reliable. METTLER TOLEDO’s LabX® software provides flexible SOP user guidance on the balance touchscreen. With automatic data handling, calculations and reports, balances powered by LabX easily fulfill the highest process security and traceability requirements and support your moves towards a paperless lab. 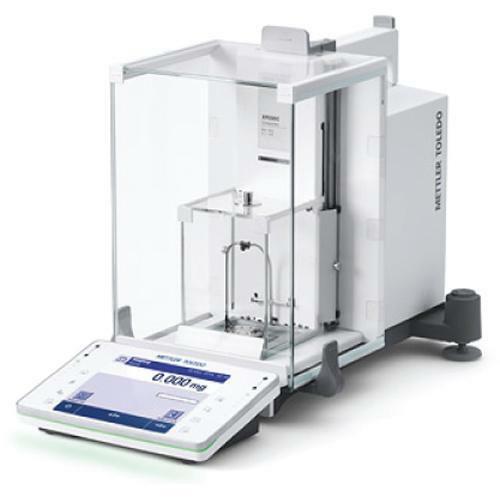 Excellence XPE Analytical Balances combine patented METTLER TOLEDO weighing technologies with decades of weighing expertise to ensure you get the best weighing results available on the market — quickly and reliably! While enjoying comfortable weighing, patented measurement technologies are working behind the scenes to give you highest resolution, fastest and most stable results as well as the lowest minimum weight of 14mg! Good Weighing Practice™ - The new XSE and XPE analytical balances have been developed in accordance with GWP®. METTLER TOLEDO developed GWP®, Good Weighing Practice™, as a standardized scientific methodology for secure selection, calibration and operation of weighing equipment. GWP® provides the documented evidence for reproducible weighing results in harmony with all current quality standards in laboratory and manufacturing. Users who focus on stable processes, constant product quality, lean manufacturing or regulatory compliance, can use GWP® as the benchmark to select and calibrate their weighing equipment. Intuitive Operation - The enhanced touchscreen user interface offers tireless, intuitive balance operation. A unique combination of accessories allow hands-free operation of Zero, Tare or draft shield opening. To eliminate cross-contamination issues use the footswitch, external electronics kit or a Bluetooth® printer. ErgoClips - Say goodbye to the traditional weighing process using weighing paper. One step dosing directly into the tare container eliminates transfer errors and saves money by minimizing sample loss. The ErgoClips reduce contamination risks, enable faster dosing processes and increase productivity. Smart Dosing - The color-guided SmartTrac™ function makes it easy to dose to your target weight and stay within tolerances. Using the appropriate ErgoClip enables you to dose directly into your container in one easy step. With the unique SmartGrid and the draft shield that disassembles in seconds, you can always be sure that your weighing area is clean and safe. SmartGrid - The SmartGrid allows any spilled samples to fall through the weighing pan without affecting your weighing result, and the drip tray underneath easily captures any spilled solids and liquids for safe disposal. Dishwasher proof - All parts of the weighing chamber are dishwasher proof for easy and thorough cleaning. Modern pipettes have an embedded RFID chip that stores a mass of information: pipette ID and volume, last and next calibration dates, and more. With the new integrated RFID reader, you can check all this in seconds and view a full report on the balance terminal – fast and error-free. Enter titration sample information securely at the balance and effortlessly transfer it to the titrator via the titration beaker & SmartSample RFID tag. RFID Based Operation — Titration Using the new SmartSample™ accessory enables a dedicated titration workflow to provide a new inter-device communication between METTLER TOLEDO laboratory equipment. Automated dosing with Quantos powder and liquid dispensing modules enables you to achieve the highest level of accuracy and safety in sample preparation and can reduce minimum weight by up to 30%.